The first day of a new year . . . fun and sun! The morning sun sprays diamond sparkles across the water. 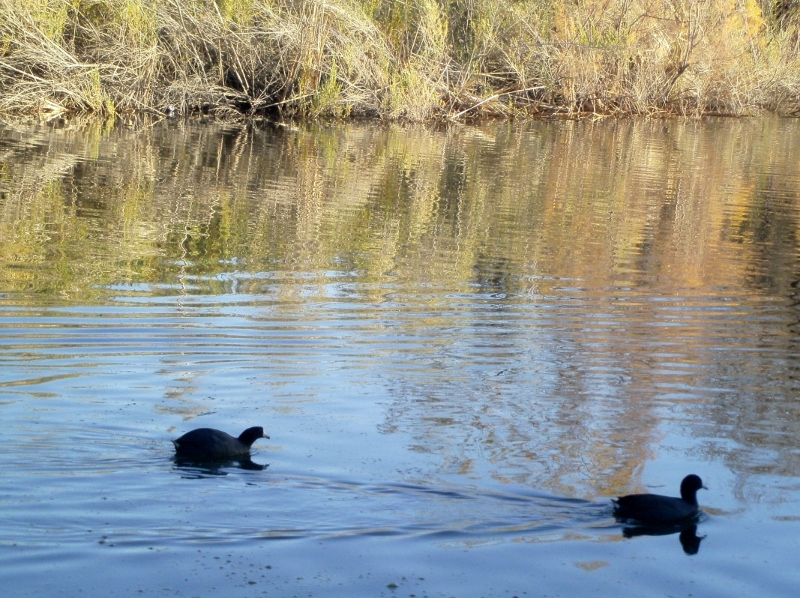 Watching ducks dive for breakfast is a good way to start the first day of the new year. Bridget, Spike and I got a good night’s sleep even though last night was New Year’s Eve, probably because fireworks are not allowed in this BLM area. No prohibition against ATVs and dune buggies though. I want everyone to have their fun. However, the constant drone of combustion engines does get wearisome after a while. One child about eight years old drives his noisy vehicle around the pond constantly for about two hours. He’s driving right under everyone’s windows. After the first hour the evil thoughts begin in my head. I start to wish for a bucket of roofing nails to scatter like corn for the chickens across the roadway. I’m not proud to say I concoct schemes involving bodily harm to a child. Oddly, these dark thoughts help me tolerate the irritating sound. At last, he turns the blasted thing off. Two minutes pass during which I actually hear the chirp of a bird. Then an adult gets on an adult-size motorized vehicle and starts making his rounds. People sit in lawn chairs at the pond’s edge holding fishing rods, watching and waiting for a tug on the line. Oh, isn’t it wonderful to get away from it all? It’s so peaceful here. Vroom, vroom, vroooooooom . . . . The good news is tomorrow is Monday and not New Year’s Day! On our morning walk the crew and I approach a man parking his pick-up truck. Three children jump out and run up to us. Two girls and a boy, all under the age of seven or so, want to pet Bridget and Spike. The littlest one shows off her brand new, pink, Barbie tackle box. Dad looks at me and smiles. He sets up little lawn chairs and a cooler at the edge of the pond. Next he hauls out a playpen from the back of the truck. “You have a baby, too?” I ask, my eyes widening. “Oh yeah, I’ve got my hands full today,” he replies. A man stops by our campsite and asks about my Casita. Actually he’s not the first to stop by here. I gave a Casita tour yesterday to a couple who want to upgrade from tenting. This man here today has a Trillium. His first question is whether I have a bathroom, because his fiberglass trailer doesn’t. He gets on the ground and looks underneath. I get out my Casita notebook and show him the specs. It’s true what I’ve been told. . . A Casita draws visitors! Throughout the day I analyze the location of the sun on the campsites around the pond. Although we’re in a picturesque spot, the afternoon sun is harsh and there’s very little shade. My neighbor has her awning out and I can see it isn’t helping at all, due to the low winter angle of the sun. The other side of the pond would put the sunshine on the back side of the Casita. However, there are lots of trees and shade on that side, not good for my solar panel. The crew and I scout for a new campsite. At last we find the perfect spot! It’s where the man with four children is fishing.. Hmmm . . . As soon as they leave, I’ll zip right over there and set up a new camp! This new campsite has its own little beach. Pretty sunset tonight. Gee, it’s nice sitting out next to the water. 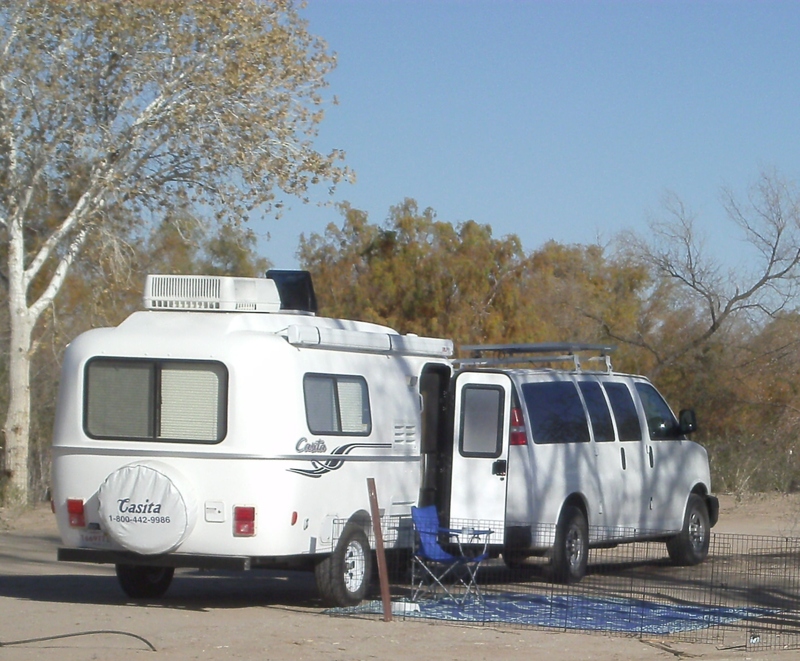 This entry was posted in Simple living and tagged Arizona, BLM, camping, casita, fulltiming. Bookmark the permalink. 52 Responses to The first day of a new year . . . fun and sun! Awesome place – except for the quad’s. Yes they can be distracting unless you are on one, lol… I love the pictures truly a remarkable site. Hope one day to follow in your foot steps, lol.. You will have to keep a journal and publish it later for the people coming up to retirment age, I would love to be at that lake looks like an amazing place to paint, take pictures, just to unwind from years of service. Thanks Sue and Crew. Enjoy the peacefulness..
It’s much more peaceful today. I guess I can’t begrudge people having their kind of fun on their day off from work. I’m fortunate to be able to enjoy this place on a weekday. I’m so glad you are enjoying the photos. I can understand your comments about bothersome issues but it sounds like you have a great sense of humor and attitude to handle the distractions. I’ll be it will be quiet now for a while. Enjoy and thanks for sharing with us. I managed to stay sane because I knew it couldn’t possibly last forever. Today it is quiet. Yes, atvs are annoying as are jet skis. I used to live on a lake and the whine of jet skis reminded me of gnats – I wanted to swat them. As you say, each to his own. I agree with bearwise about your writing. As Hub and I gradually get rid of “stuff” (sold my grandmother’s antique German bisque dolls today – no one children to leave them to) the house is becoming emptier and we are feeling lighter. Your words inspire me to be less encumbered and more enlightened. Thank you Sue and crew. Many blessings for you in this new year. I don’t know if this is happening to you or not . .. . I found that the more I gave away, the more I wanted to give away! It’s liberating. May you also be blessed in 2012. Susan, this place looks wonderful. I love the water !! Your patience is remarkable with those kids, I may have had to put something in their way so they had to make a big detour. LOL. Glad you are enjoying the sun and fun. If I started making detours, there’d be a kid in the water! I wish you were having better days, Pauline. They will come, they will come .. .
Well Sue, you sure have a lot more fortitude and people patience than we do. I’m afraid we would have long departed that site in search of quieter surroundings. We once moved 3 times in one day south of Quartzsite for some of the same but less noise issues you are having. It’s the peaceful sounds of nature we long to hear. Wind in a tall cactus, the lone mournful call of a distant coyote or the willow wisp birds darting among the Mesquite trees. One generator, ATV, or hollering child will send us packing every time. You may want to search out quieter pastures and listen to the stars whispering their way across a silent night sky………. I thought of you and Kelly…. Hmmm I wonder what they would do in this situation . .. WWA&KD is a rule to live by! I figure I’ll see how it goes during the week. Now that the holiday is over it is quieter. Of course, the generator choir will probably start up again at sunset. Gotta watch that tv! Fun and Sun….how much better can it get??? You’re sure in the right place right now, Sue. Hope you and the crew enjoy the rest of your day. We’re sitting here at home with the heat turned up trying to stay warm while we watch the Rose Bowl game in Pasadena, California. So far, at halftime, it’s been a record breaking game. Still rooting for our Oregon Ducks to win. Can you say…”Good Luck, Ducks”?? Siting in Tn watching the SNOW fall makes me so jealous of you.I had planned on leaving here to go home to Fl ,but had to stay another day and now it SNOWS!! I had a small Scamp but sold it this summer it was too low to the ground but your C looks about right for towing. Enjoy!! I’m sorry to make you jealous, Sherry. I got stuck in snow by delaying my departure from New Mexico . . . It doesn’t even feel like I’m towing anything, the Casita is so easy to tow, probably like your Scamp. I’m glad I opted for the high axle. I haven’t scraped yet. Happy New Year!!! How’s the solar working? Did you find a problem? Did Starlite treat you well? We’re thinking of stoping there on the way back from Q’site. Had New Years eve and anniversey at Groovys…great blue grass band! Hope you have some peace and quiet! The solar is great . . . fully charged today! Starlight Solar is a good company. I’m pleased with the work they did, and the treatment I received. Thanks for vote of confidence, do you know WHAT they found wrong? Having title problems with NM and FL so our departure being delayed a bit…..paperwork, UGH!!!! I hate it! Oh yes the ATVs and the Snowmobiles and the Jet Skis all drive me crazy. I want the quiet sounds of nature not ski boats or jet skis. Your sinister thoughts remind me so much of my own. It’s one of the reasons I don’t stay on BLM land more than I do. Glad to hear it is quieter there today. Hope it stays quiet for at least the next few days until the weekend warriors show up. The shoreline of the pond is all beaten down. Posts have been put up telling people no motorized vehicles beyond the posts in order to protect the habitat. Yet I see tire tracks all over, right up to the edge where the water birds feed and marine life lay eggs. I raked our campsite clear of fishing line, metal pop-tops, plastic bottle caps, cigarette butts,,,, There are beer cans and soda bottles littered around and bobbing in the pond at the shore. I guess I’ll put on my vinyl gloves and go around with a trash bag. There is so little respect for the value of peace and quiet. Compared to other forms of life, human behavior is disgraceful. That’ one of the reasons we won’t workamp in this type of park. No respect for the land or anyone else. Everything old is new again….. I totally agree with you, as an avid fisher person, I always carry a garbage bag and a plastic container and thow my stuff especially line into it, so the birds don’t get tangled in it, then people wonder why area’s are blocked off and can’t be used any more. I think human beings can be the most destructive creatures in the land, they want to enjoy these lovely places but they don’t care what they leave behind. Its pretty easy to clean up after oneself and their children. I have taught my son “being green” isn’t just about recyling but about cleaning up after ourselves, leaving things the way they were – to me that is green. I am glad you posted this maybe someone will think twice before they throw their pop can / beer can / cigarette butts on the ground. Be Green Keep It Clean .. thanks Sue. So happy to hear solar power is good and the crew looks so happy and relaxed. Sure does look like an awesome place and you can sit by the fresh water, which is hard to do in Florida as I discovered visiting there in May, alligators oh my goodness, ha ha.. take care. It is calm water, although the photos make the pond seem larger than it really is. Fraid I would have had the same evil thoughts, mine might have included asking parents why they let small children drive dangerous vehicles. I am old fashioned, I know. As you stated, you were able to wait them out, which is a good thing. We would not want to have to pool our money to bail RVSue out of jail! Sue–I don’t think you could possibly have a better “journal” than the one you write in your blog, it even has pictures. The ones today are great by the way. I think you will probably enjoy the lovely place you are in for the rest of the week. Hopefully the others have RV generators which shouldn’t be too bad and they probably need them to charge up the batteries. It sounds like you got some enjoyment from some of your neighbors too. Hope you got moved into the “better” spot. It was nice today. I’ll have to make a decision whether to stick around here through another weekend. I don’t want my patience to run out . . .
I’m with you, I hate when people are not considerate. We had neighbors shooting fireworks on new years eve from 6pm untill 12:30 am. about the time you would think they might be done they would start in again. They had such big stuff it would make a person jump when they fired one off and it also scares my dog to a shaking mess.It is against the law in our state to have any noise making fireworks so I did end up calling the police and they put and end to it. Oh how nice the peace and quite is. The spot you are at is gorgeous. Happy new year to you and the pups. And when you are forced to do something like call the police or even just to ask them to cut down on the noise, somehow you become the bad guy. I avoid confrontations. If it gets to be more than I can take, I’ll move. Of course, you can’t do that when you live in a house in a neighborhood. Happy new year to you and your pup . . .
Around here (Central Coast of California), the ATV accident rate revs up on long weekends and holidays. The emergency rooms fill up. It’s a rare weekend when there aren’t broken bones, serious scrapes and unfortunately, an occasional death…all due to ATVs being driven recklessly (or by children) on the beach. It’s sorry mess when “fun” involves medical emergencies. Here’s hoping no one meets an awful accident where you have to see it or hear it. Emjay, Where on Central Coast? Santa Maria was home for 20+ years up until 6 years ago. Chuck, it’s Pismo Beach. Nice country, but gettingn populated. Hi Sue, Margy and I and the Bichon Brothers are camped by the Salton Sea tonight. It has been peaceful and quiet all day. I did try to get our Direct TV set up today so that we could watch the Ducks beat Wisconsin, but no luck. My wife was unhappy with me on that count, and I was disappointed too. Anyway, we love the quiet here. We had kids riding motor bikes up and down our road when we left home and it irritated me for as long as it lasted. ATV’s are even worse. Why do people have to disturb a nice peaceful setting with that foolishness? We are going to take in a dog show this weekend and then head over toward Yuma or maybe Ajo. It was 82 degrees here today. The bichons are all worn out and sound asleep next to Margy on the bed. How could it be any better than this? Well…. there was that Ducks game…. I can picture your sweet bichons lying about, all soft with sleep, fluffy little cuties . . . It warms the heart. My crew are sleeping next to my right now . .. It’s morning nap time. Congratulations on your Ducks’ win! Great weather you’re having . . . Nice and warm here, too . . .
Patience please . . .
“Sounds” like your unknown site is not quite so unknown. I wouldn’t be surprised if a lot of those areas along the Colorado River region are filled with ATVs and motor bikes. My brother says he won’t go to the River area any more because there are so many of them, especially weekends. Our snow is almost gone and nice weather makes me want to get out and wash windows. Wish you had a bunch of windows to wash, I’d come down and do yours. Hey, wash my whole house if you want to! I’m glad you’ve got some good weather although I hate to tell you, it’s not going to last . . . Ooh, that wasn’t nice. I’m sorry. Bad rvsue, bad! It’s predictable. Some holidays, it’s easier to find peace and quiet in a corner of a Walmart parking lot than in a country campground. Back when I was doing this stuff, I discovered my roaming habits went into reverse after 40 years of being one of the working folks. During the week, I took to the country. From Friday afternoon to Sunday, I responded to the charms of town – saw a movie, did laundry, or took in an afternoon at the library or an empty park, found a likely quiet street where I could spend the night. That worked pretty well, especially on long holiday weekends when waaay too many ATVs, unsupervised kids and loose dogs infested the forest. By Sunday afternoon, most of them had gone “home”. Happy Camping is a process, not a particular destination. After a while, I figgered that any noise or unpleasantness was mostly just bad planning on my part. A result of inattention, like biting my tongue. Sad, isn’t it? These days, even freedom requires scheduling. You can’t fight the madding crowd, but you can go where they ain’t. Bob, who wishes he were free to be where they ain’t. I’m naive to think it’s possible to share a popular camp with people without being assaulted with noise and the sight of litter. As I watched that child drone around the pond for two hours, I thought about all the criticism hurled at teachers for not being able to educate children. But how can you teach a child whose non-school hours are comprised of nothing but passive entertainment? Learning takes effort. Instead teachers are directed to keep the students engaged (read “entertained”) I’m afraid the bold and bright America of the last two centuries is becoming Knucklehead Nation. To suggest that child could have spent the day fishing or using a field guide to learn the names and habits of the many water birds here or to collect and identify plants with a parent or to make a boat or to pedal a bike or simply run around and play. . . well, it’s not going to happen. Now I need to settle down and get back to being happy. Your comment is very interesting, Bob. I guess it’s come to that. Well, you can add to your list of abominable miscreants people who like to share their idea of music with the world in general. Boom boxes were bad enough, but whoever first put speakers on the OUTSIDE of RVs ought to be tied to a chair in front of them every weekend for the rest of his sordid and unnatural life. This item has replaced the former number one on my list, generators. Especially run early in the morning and after dark. The problem has abated slightly with the introduction of inverter style small quiet generators in the last decade, and the Microquiet line from Onan. But it all adds up, and is often still like camping at a construction site. What do you call a camper who won’t turn off his generator? An Onanist? I’ve often wondered why people would want to go way out to the woods just to make an incessant racket. Heck, they can do that in their driveway a lot cheaper… if it weren’t for the cops. I didn’t mention it in my blog entry, but it was music that forced me to lodge a finger in each ear in order to sleep. The last I heard it was going strong at 11:30 p.m.
No wonder so many people are mentally ill. Silence with only the sounds of nature is recuperative. Yesterday and last night were a lot quieter. The first night I propped the pillows so I could keep a finger in each ear and go to sleep. I didn’t have any ear buds or cotton. Fingers worked! My my Sue, you opened a can of worms. And I can’t believe all the comments condemning our children for having a fun time in a “public” camping area. ATV’s, motorcycles and sand rails are a part of the younger generations lives….as are generators in the older generations lives. They all make noise. Anyone that complains of these simple “fun” noises should pack up and find a campsite where they are totally alone. Sorry for the rant, but everyones idea of fun is not sitting around doing nothing. Glad you weighed in on this topic, Billy Bob, to present a different point of view. I’m sure there are many who agree with you. If you’re looking for a place without the family mob scene, ATV’s, generators and such just move a little bit north to Mittry Lake, a free 10 day BLM area. There are perhaps 20 nice pulloffs all along a very pretty lake. GPS 32.817314 -114.472315 Take a look in Google Earth. We were there until yesterday and it was just wonderful.